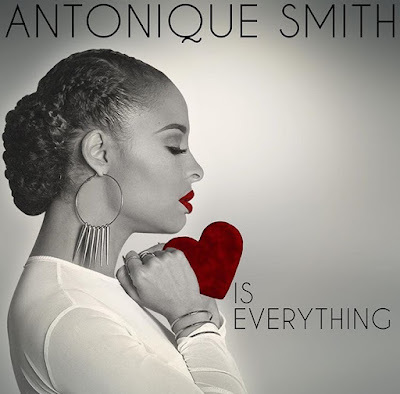 Styling On A Budget: Antonique Smith Talks About Her New EP "Love Is Everything"
Antonique Smith Talks About Her New EP "Love Is Everything"
Grammy-nominated singer and actress Antonique Smith celebrated her Love Is Everything EP release in New York City at Le Reve on Thursday, November 19, 2015. We had the opportunity to chat with the talented artist about her music and other projects she's involved in. Acting has been Antonique's passion and she has appeared on Broadway, and major films such as, Notorious, but now she is letting music take the lead. Music is my first passion. My first love. The EP is called Love Is Everything, it's on iTunes. I don't remember how I came up with the name [of the EP]. I came up with it back in the day, but it's so true to my message right now. Love is the most powerful force in the world and we don't use it. It's the anecdote, it's the cure for all of the bad things that are going on all around this world. From black lives matter to Paris, people dying in concerts and cafes. It's just everything. Love cures all of that. I'm just really trying to share a message of love. It's a six song EP, a small aspect of a few different experiences of love. I like to call it pop soul, with a hip-hop appeal. It's a fusion. I grew up in East Orange, New Jersey. Whitney Houston was my first inspiration. I was inspired by Whiteney, Celine Dion, and Aretha Franklin, so that's how I sing. But I love Mary J. Blige, I love hip-hop, and that's what I listen to. It's a fusion of those things, and I grew up in the church, so it's a little bit of that too. I'm an activist. I've been traveling the country with a hip-hop caucus. I've been talking about how the climate change, and the amount of pollution in our air and water is what's giving us cancer and asthma. Everyone wants you to believe that it's hereditary, because they don't want to loose the profits that they're making from being able to dump pollution in our neighborhoods. 68% of African Americans live within 30 miles of a powerplant. Those powerplants give off more emisions than cars, planes, and trains put together. I've been going around the country to get people to join together, to start a movement to demand a change. I have a special needs sister, Antonia. She is my whole heart. She's why I like to fight so much for the underdog. That's why I feel such a passion about speaking out and really helping the people who can't help themselves. Well Love Is Everything is on iTunes right now. That's my first body of work. An album will be following the EP next year. It might be a continuation of Love Is Everything. More love experiences. We look forward to hearing and seeing more from Antonique!